What a way to start out June! Can you believe this? A much needed spark or the epitome of a lost season? Discuss amongst yourselves. 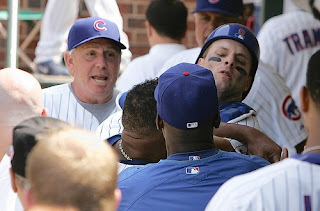 Awful Announcing has the YouTube video of the dugout scuffle, and since I like to embed videos in our blog about as much as I'd like a sponge bath from Neifi Perez, you can go there to view it. I like how each time I hear about it, the fight seems to grow have grown more and more intense, with more twists thrown in. Now they are saying that Barrett has two black eyes and was slammed up against a locker. This is quickly becoming the stuff of urban legend. "And then Fat Z cut off both of Barrett's arms with a chainsaw and drank his blood!"